Randy Johnson was 118 – 62 (.656) 2.83 during his Arizona Career, and might very well be the 1st Arizona Diamondbacks player to be inducted into the Hall of Fame with a DBACKS cap. Curt Schilling was 58 – 28 (.674) – with a 3.14 ERA. They were the last teammates to K 300 players each in the same year (2002). The DBACKS rode these two great pitchers to end the Yankees run of 3 World Series in 2001 – and Arizona won their 1st World Series. (The 4th year in the existence of the team). The franchise would just love for their young Starters to fill out the Rotation for the same kind of stability as these two guys gave the club in their time in AZ. Let’s take a jaunt around some of their most successful rotations. Arizona had a decent rotation in 2008. Dan Haren, Brandon Webb and Randy Johnson united to post ERAs south of 4.00. Combined, the whole rotation mustered a 3.98 mark, which is OK by normal standards. Nothing special, though. But the last time they truly had a dominant rotation was in 2002, where the starters compiled a 23.7 WAR (Wins Above Replacement), which led baseball. For those anti-WAR people, they finished fourth in ERA (3.68) and first in FIP (3.49). The ERA suggests that the starters were incredibly proficient, but the even lower FIP further confirms their “dominant” billing. What’s more, they also led baseball in K/9 (strikes per nine innings) with a 8.43 mark. 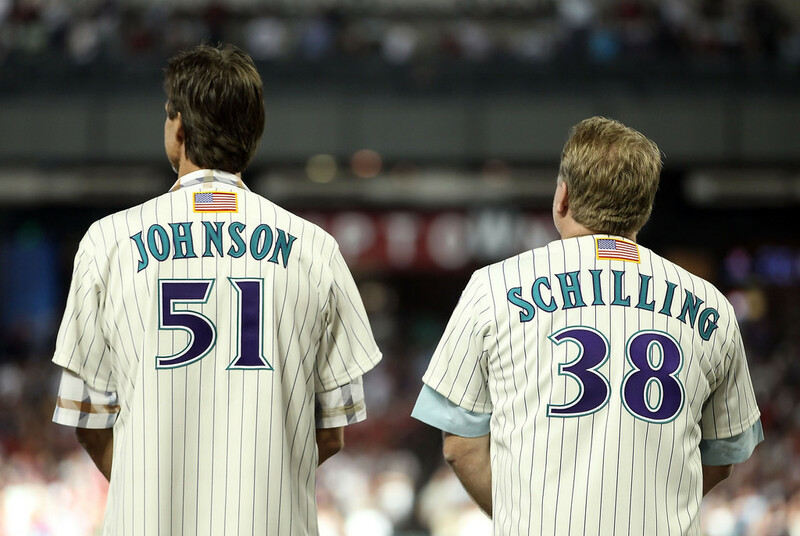 That’s a little history for you, and with that said, I think most will agree that it’s too premature to deem Corbin, Miley and Skaggs the next coming of the Curt Schilling-Randy Johnson duo that anchored down Arizona’s historically good 2002 rotation. Johnson and Webb led all pitchers with 8.0 and 9.3 WARs, respectively. Corbin, Miley and Skaggs haven’t even combined to make 100 starts, let alone top the charts in WAR. Of the three–Corbin, Miley and Skaggs–Corbin’s easily been the alpha. His 1.71 ERA ranks third in the National League behind Clayton Kershaw and Jordan Zimmerman. Yeah, that’s some good company. Excuse me for being Mr. Obvious, but it’s highly-unlikely that Corbin continues his torrid pace. His glowing 1.71 ERA is great, but his 3.01 FIP, which measures only what a pitcher can control (walks, strikeouts and home runs), suggests that he’s due to regress. By comparison, Zimmerman has a 2.79 FIP and Kershaw has a 2.58 FIP. So, Corbin’s FIP is hardly elite. What’s also suspicious about Corbin is his uncommonly low HR/FB (Home run to fly ball ratio) of 5.0 percent, which is the fourth-lowest in the NL. Chase Field is traditionally assumed as a hitter park, which makes Corbin’s low HR/FB unsustainable. And by comparison, he had a 13.5 HR/FB ratio in 2012. That’s more like it. He could regress to some number in between his 2012 and 2013 totals, but 5.0 is too low. Enough of Corbin, though. Miley’s 5.01 ERA (4.36 FIP) indicates that he’s limboing under expectations after finishing second in the 2012 NL Rookie of the Year voting to Bryce Harper. His problem is pretty obvious: He’s issuing too many free passes. He’s walking 3.3 batters per nine innings this year. Last year, he walked only 1.7. It’s only natural that his ERA and FIP would increase. Miley’s actually been yielding weaker contact despite the spike in walks, as his LD% is 16.3 percent compared to his 2012 mark of 23 percent. Then, there’s Skaggs, who’s first start of 2013 saw him pitch six scoreless innings against the Texas Rangers on Monday. The jury is still out on Skaggs, but his curveball can already be deemed a weapon. It drew seven swings in misses on Monday, topping out at 78 MPH. He also boasts a decent changeup as his alternative off-speed weapon. So, in a vacuum we have a mixed bag of results, a lot of potential, a lot of unknowns and plenty of positives. 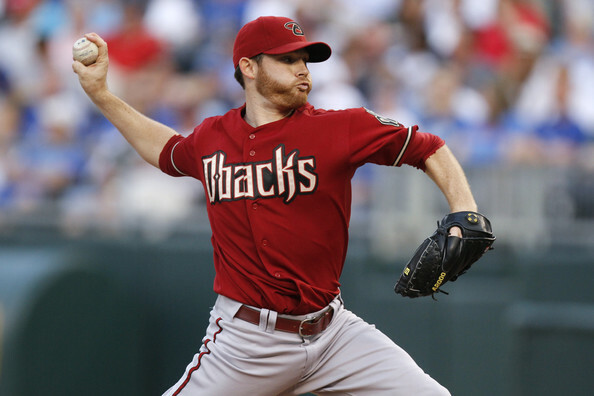 Just how good can the Diamondbacks’ rotation become? It’s cliche, but the ceiling of Corbin, Miley and Skaggs is high. Add Trevor Cahill into that mix, and that’s a quality quartet rounded out by Brandon McCarthy. The rotation’s combined 3.74 ERA, which is the 12-best mark in baseball, reflects upon that, and if the trio of lefties continue to develop, they could become even better. All stats courtesy of Baseball-Reference, FanGraphs and ESPN.com unless otherwise noted. 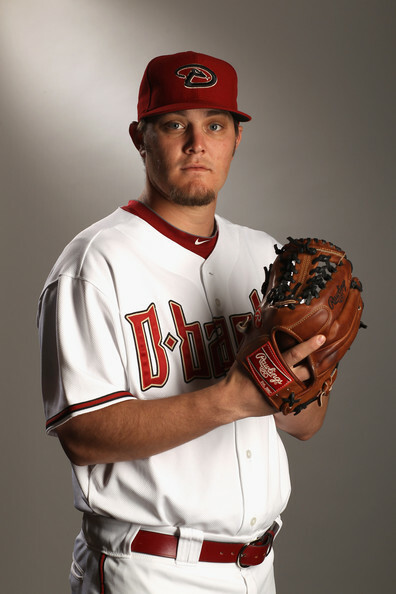 Forgotten about are Daniel Hudson and Ian Kennedy, both members of 2011 NL West Champ DBACKS were a combined 37 – 16, (Kennedy NL Leading 21 Wins versus 4 Losses (Hudson 16 – 12) before injuries and inconsistency kicked in. If they add anything to the fold going forward – it would be a bonus. Then there is also Brandon McCarthy (signed through 2014) and Trevor Cahill (signed through 2015 – with 2 consecutive Team Options in 2016 and 2017) that will be part of what looks like a dominant pitching Starting Staff for at least a couple of years. Posted on May 31, 2013, in MLB Teams: Articles and Analysis and tagged 2001 world series, 2011 Nl West Champs, 2012 NL Rookie of the Year, arizona diamondbacks, brandon mccarthy, Brandon Webb, bryce harper, chase field, dan haren, daniel hudson, jordan zimmermann, new york yankees, nl west, Patrick Corbin, texas rangers, texas ranngers, trevor cahill, tyler skaggs, wade miley. Bookmark the permalink. Leave a comment.